Update: Aaaaaand it's gone, according to Australian site Ausdroid. 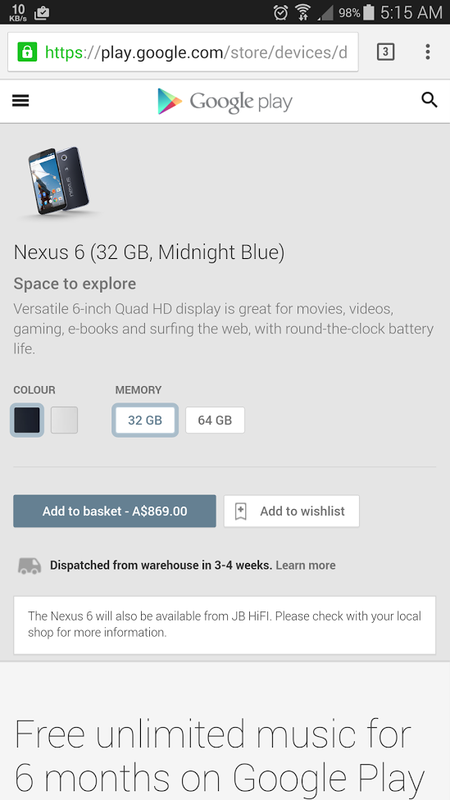 It looks like Google isn't having it any easier keeping the Nexus 6 in stock in the southern hemisphere. Psst. Hey, Aussies. Head over to your local Google Play Store's Devices section. You might see something you've been waiting on for a while. The Nexus 6 costs 869 Australian dollars for the standard 32GB model, or 929 Aussie bucks for the 64GB upgrade. That isn't quite as bad as it sounds to Americans thanks to the exchange rate, but they're still paying a solid $20-70 more than us in terms of USD. That's unfortunately pretty standard in Australia, where consumer electronics are always more expensive. At least both the blue and white models are available, unlike some other places, and it comes with six months of Google Play Music All Access for free. 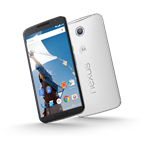 Australian readers, if you want to get a Nexus 6 in your Christmas stocking, I would hurry up and buy one now. Chances are pretty slim as it is.